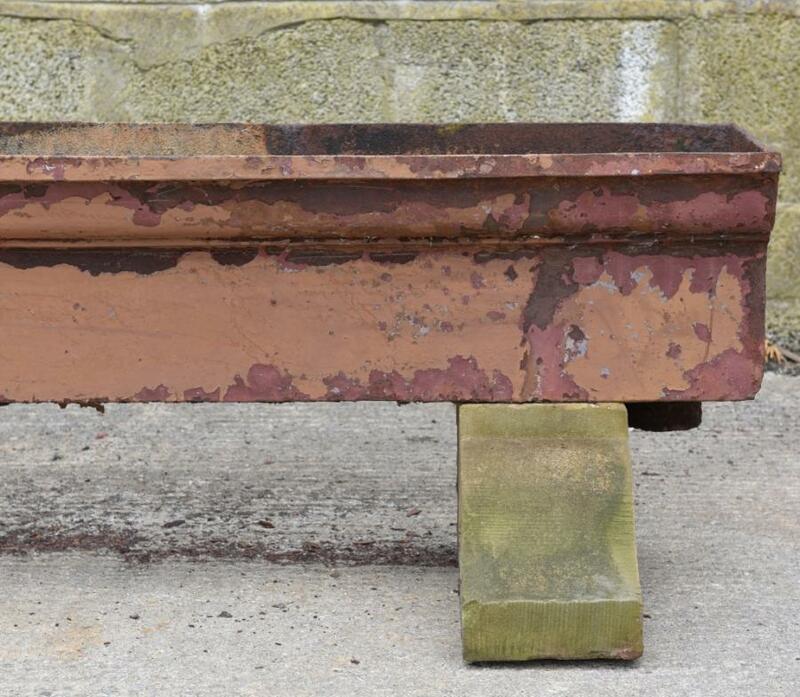 This antique Victorian oversize cast iron guttering with ogee moulded front can potentially be turned into the worlds longest antique garden planter or trough.Shown are versions of approx 11.5 feet(3.5meters) and 17.5'(5.3 meters) but with further central sections added could be made up to approxiamately 134 feet (41 meters). The middle sections are 73.5inches(186.5cm)wide and fit together perfectly (bolted and sealed if necessary) Shown raised on the same stone corbels the gutters sat on when used on a Victorian building ( Carlisle )These can be used as shown or built into a wall the other way up, as they were originally, to support the gutters. Or the trough can be sold without the stone supporting corbels.Bricks, for example, could be used instead. There are only two end gutters and these will be sold tgether as a trough of whatever length ( with or without middle sections.) The remaining gutter sections can be sold singly or in multiples to be joined together as needed.End pieces could be made if necessary. Dimensions in inches(cms);10.5(26) high. 13.75(35) max depth. Height shown raised on corbels is 20(50) The gutters are heavy and have plenty of wear left in them. Please see blog ( via News tab on Haes website ) for larger/more pictures. If you need any further information please get in touch.